A huge cloud of gas that looks like the head of a seagull shines brightly in a gorgeous new picture snapped by a telescope in Chile. The photo, taken by a telescope at the European Southern Observatory's La Silla Observatory, shows the head portion of the Seagull Nebula. The cloud of gas spotlighted in the image glows intensely due to radiation blasted out by a hot young star at its heart, scientists said. Like other nebulas, the Seagull is a stellar nursery — an enormous cloud of dust, hydrogen, helium and other ionized gases where stars are being born. Nebulas come in a variety of sizes and shapes, some of which spur astronomers' imaginations and evoke comparisons to animals or familiar objects. The Seagull Nebula is so named because it resembles a gull in flight. The nebula, which is formally known as IC 2177, spans about 100 light-years from wingtip to wingtip. It's found about 3,700 light-years from Earth, on the border between the constellations Monoceros (The Unicorn) and Canis Major (The Great Dog). The nebula appears to be close to Sirius, the brightest star in the sky. But IC 2177 actually lies more than 400 times farther away from us than Sirius, researchers said. The bright star lighting up the Seagull's head is known as HD 53367. This star, which is visible in the center of the image and could be taken to be the bird's eye, is about 20 times more massive than our own sun, researchers said. 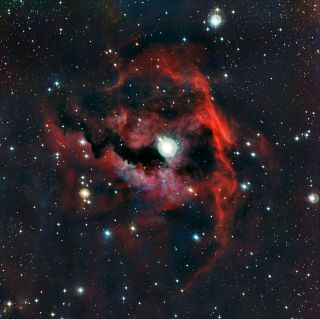 Radiation streaming from the nebula's young stars causes surrounding hydrogen gas to glow a rich red color. Light from these hot bluish-white stars also scatters off tiny dust particles, creating the blue haze seen in parts of the picture. Parts of the Seagull Nebula complex were first observed in 1785 by the famed German-British astronomer Sir William Herschel, but the region imaged in the new picture weren't photographed until a century later, researchers said.